Sunbelt Publications is holding a Spring Showcase on Thursday, May 14, from 5-9 PM at the O'Dunn Fine Art, a multi-artist show and author exposition featuring local Sunbelt authors. Brad Bruce, a professional wine procurer, will be pouring some high end tastings for the event which also includes books and paintings. January 28, 2015 (La Mesa) -- Israeli artist Aaron Zigel is bringing his wonderful oil paintings to O’Dunn Fine Art in La Mesa Village, an international first for the gallery. The artist will be present at the opening of the exhibition on Friday, February 6, from 5 pm to 9 pm: 8325 La Mesa Boulevard, in La Mesa Village. September 8, 2014 (La Mesa)—The East County Cash Mob is back – and you’re invited to help several struggling small business owners in La Mesa’s downtown village all day on September 13th. “Times have been tough with local construction on the city streets. Their business has dropped 80 percent,” says Susan Barron, organizer of the event, said of the impact that torn up streets from a downtown revitalization project is having on local merchants. Act ll 8321 La Mesa Blvd. Wildflowers 8323 La Mesa Blvd. Amethyst Moon 8329 La Mesa Blvd. 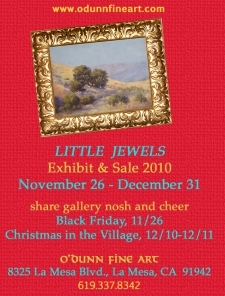 O’Dunn Fine Art 8325 La Mesa Blvd. September 17, 2013 (La Mesa) – On September 27 from 5 to 7 p.m., costumed “Steampunk” fans are expected to join the celebration of “A Day in the Life,” an art show opening at O’Dunn Fine Art. “Colorado artist Joe Bonomo has taken the characters from the Beatles’ Sgt. Pepper’ album and interpreted them as Steampunk characters…totally original,” gallery owner Shannon O’Dunn told ECM. The artist will be on hand at the opening, which will also feature live music, food and beverages. “Even if you don’t speak Steampunk (or the Sixties, for that matter) these oil paintings are gorgeous,” said O’Dunn. The exhibit will also feature a replica of the time machine seen in the 1960 movie Time Machine and in The Big Bang Theory. August 14, 2012 (La Mesa) – O’Dunn Fine Art is showing a select group of paintings from 20th Century postwar America on August 17 from 4 p.m. to 8 p.m. at the gallery, 8325 La Mesa Blvd., La Mesa. The event features fresh-to-the-market pieces by modernist Gideon Sandelin and works by listed artists Ilya Bolotowsky, William Joseph Rakocy and Ray Vinella. Sandelin’s son, Raul, will be on hand to talk about his father’s art and paintings. Sandelin’s son, Raul, will be on hand to talk about his father’s art and paintings. This hosted event is open to the public. Visit www.odunnfineart.com for more information. May 25, 2012 (La Mesa) -- O’Dunn Fine Art is hosting a first viewing of Paul Strahm’s new paintings on May 26 from 5:00 p.m. to 8:00 p.m. at the gallery, 8325 La Mesa Blvd., La Mesa. Strahm’s fresh-to the market pieces include paintings of Torrey Pines, the Del Mar Fair, The Gaslamp, Little Italy, Balboa Park and more. April 24, 2012 (La Mesa) – O’Dunn Fine Art is hosting an opening of Still Crazy: Flowers, Found Objects and Favorite Things on April 27 from 5:00 p.m. to 8:00 p.m. at the gallery located at 8325 La Mesa Boulevard, La Mesa. The featured art work is a collection of still life paintings from 20th century to contemporary, European and American. The still life tableau allows the painter to select objects of particular esthetic appeal or personal significance, and to control composition and lighting.The best still life paintings bring visual respite and shared human experience. Featured artists include Ray Vinella, Gregg Kreutz and Brenda Morrison, among others. This is a hosted event. For more information contact the gallery at 619-337-8342. May 18, 2010 (La Mesa) – Enjoy Art in the Garden this Friday from 4:30-7:30 p.m. at Gio Bistro Wine Bar. O’Dunn Fine Art and Bella Mesa Galleries will showcase artwork for sale, offering special pricing for art garden visitors. Also enjoy free wine-tasting, appetizers, and visiting with local artists and gallery owners. February 18, 2010 (La Mesa)--The public is invited to a reception and grand-reopening of O'Dunn Fine Art from 5:30 to 7:30 today. The gallery has moved to a newer, larger location at 8325 La Mesa Boulevard, across the street from its original space in La Mesa's downtown village. October 12, 2009 (La Mesa) – An exhibition of abstract artwork by noted artist Dawn Sebaugh opens tomorrow and will run through October 25 at O’Dunn Fine Art in La Mesa. In addition, the gallery will host a champagne reception where guests can meet the artist on Saturday, October 17th from 4-8 p.m.
July 28, 2009 (La Mesa)-- Twenty oil paintings by El Cajon resident Jack Jordan are now on display through the end of August at the Dr. William C. Herrick Community Health Care Library, 9001 Wakarusa St. in La Mesa. The artwork includes landscapes, western themes and portraits. Jordan is a premier oil painter whose work has appeared in national magazines and many galleries in the U.S. and Mexico.